Then I was brought back: it all starts with education. I looked at the communities that fed into that courtroom and what didn’t they have? They didn’t have access to high-quality education. That’s what sort of brought me full circle back to it. So the reason why I’m able to look at these same issues 10 years later is because I now have a different perspective, from a different vantage point, as to why education is important. My grandfather was from Baton Rouge, and he migrated to Chicago. And I always think that I’m kind of circling the wagon and going back through his past. I was in Chicago, and I went back to Louisiana where he is from [Shenita lived and worked in New Orleans pre-Katrina, and returned to New Orleans when she worked for NACSA post-Katrina]. They applied. I remember, for the interview: we tell them [the applicants] to bring 5-8 people for the interview. You don’t need to bring a lot of people. Of course, they bring all of their supporters and everybody’s got on these t-shirts, and I think, ‘Okay, great…’ A lot of people thought, ‘They don’t have this management company behind them…’ Their track record of success was the school that was operating under the previous administration, but their application was evaluated, and the school was recommended for approval. It was just really a great homegrown story of the community being involved and wanting their school back. I remember the principal: you know, she’s a traditional school principal. She said, ‘I’m kind of interested in this charter… I know I want my school back, so we’re going to do it.’ I think the charter also gave them autonomy they didn’t have before, so they were able to do different things that they weren’t able to do as a district [school]. 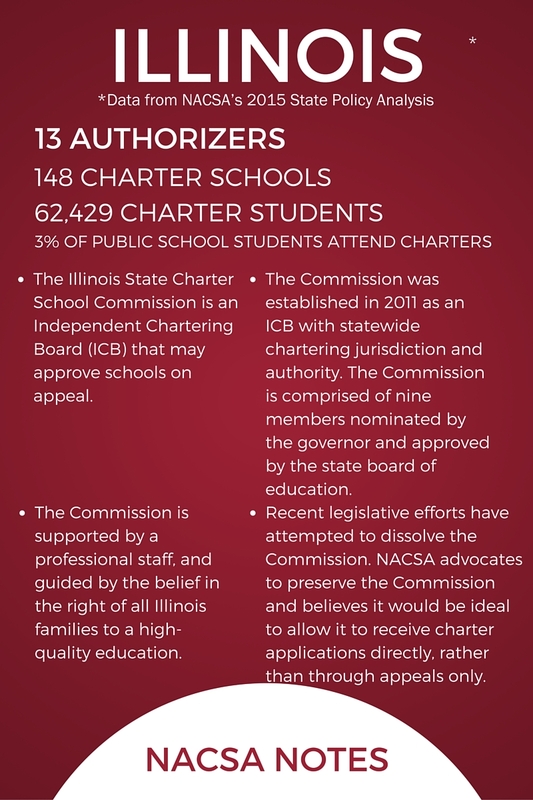 The Illinois State Charter School Commission: we don’t receive direct applications, and we don’t release an RFP to create schools. 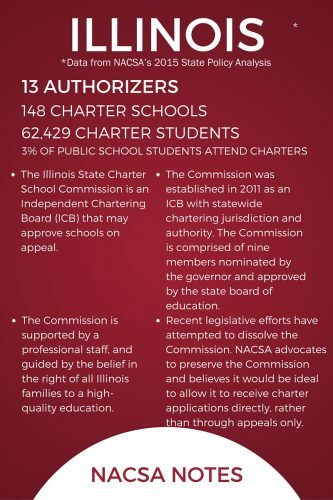 The Commission only approves schools by appeal. 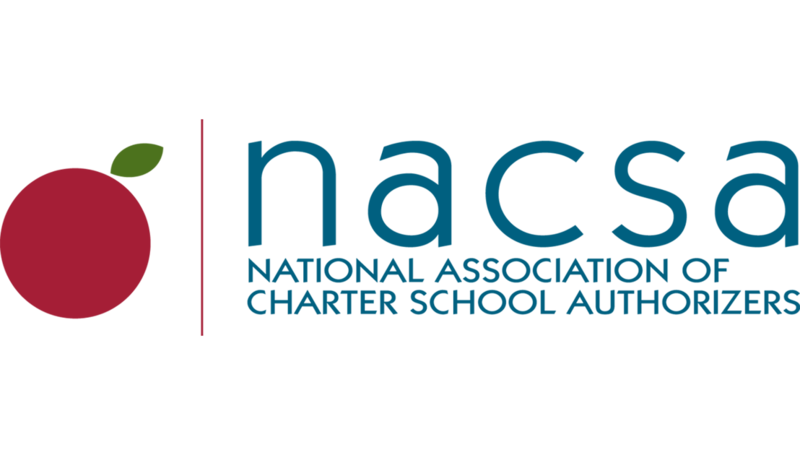 If a school, or an applicant for a charter school, makes a proposal to the local district and the district denies it, then the applicants have the opportunity to appeal to the state—the state commission. The state commission reviews those proposals and decides whether or not they meet the law and whether or not the schools are in the best interests of the children in that local community. That puts us in a very unique position, because the district has certain feelings about what [the Commission is] doing. Number one, they don’t think that a state agency should have the ability to decide what happens in their local district. But again, from my experience working as a prosecutor, everybody gets their day in court, right? Everybody has an opportunity. Just because one group makes a decision, [there should be] an opportunity to appeal that decision in some way and the Commission is the body [that listens to the appeal]. And there’s also the benefit, again, of engaging and educating applicants about what is high quality… It’s our job to make sure that that proposal meets the law and is high quality and is in the best interest of all students in the communities.